Traditionally the 15th August, Feast of the Assumption of our Blessed Lady, is a significant day in Abbey parish. Always referred to locally as ‘Lady Day’ is was the start of the pilgrimage to Lady well, very important in times past. It was also a special day set aside to recall the history of Kilnalahan and to remember all those buried in the cemetery at Kilnalahan monastery in Abbey village. This tradition still continues and each year on the 15th August a special Mass is celebrated in the cemetery. People from the parish and beyond return to remember their loved ones who are buried there. 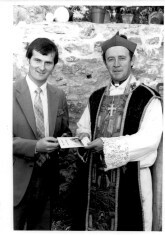 We are reminded that in 1981 a special celebration took place in Kilnalahan. Bishop Cassidy, who was then coadjutor bishop of Clonfert diocese, concelebated Mass to mark two important events – the completion of restoration work on the ruins of Kilnalahan Monastery and to launch the publication of Frank Burke’s book ‘The Abbey of Kilnalahan’. The following is the article that appeared in the Connacht Tribune the following week and which is reproduced here courtesy John Donnelly of Conicare. “I was very anxious to be here because this place is steeped in ecclesiastical history”, said His Lordship, Bishop Joseph Cassidy Coadjutor Bishop of Clonfert, speaking in the Abbey of Kilnalahan at Abbey, Loughrea, during ceremonies celebrated there on Saturday, Feastday of Our Lady, to mark the completion of restoration work on its 12th century buildings. 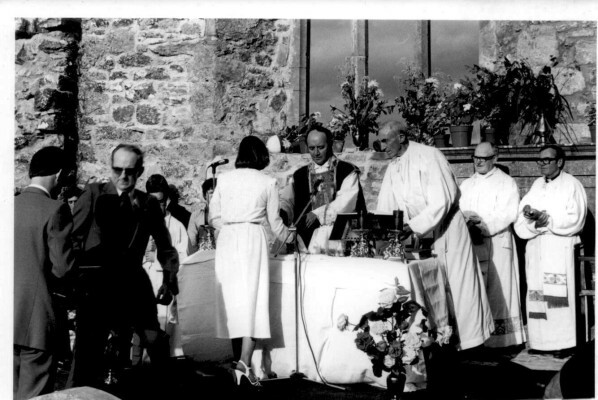 Bishop Cassidy concelebrated Mass within the walls of the roofless ruins beside the memorial chapel of the de Burgo clan, twenty-two of whose members are listed as guardians of Kilnalahan between the years 1645 to 1767. Afterwards His Lordship launched a booklet on the history of the Abbey of Kilnalahan, written by a school-teacher of the parish, Mr Frank Burke, Duniry and formerly of Abbey N S.
Commending the author on the excellence of his work, Bishop Cassidy said that he had learned from it that John de Burgo was consecrated Bishop of Clonfert in the Abbey in the year 1642 and that it was then the most important church in the Diocese of Clonfert. The Abbey of Kilnalahan was, he said, an active religious centre from 1252 to 1790, a period of five and a half centuries. The Abbey was first inhabited by the Carthusians for nearly 100 years, controlled for a few hundred years more by the absentee Knight Hospitallers of St John and had associations for nearly 500 years with the omnipresent and fervent Franciscans. The Abbey of Kilnalahan could, Bishop Cassidy continued, boast of the beautiful John Bresnagh chalice of 1718 which was used that evening in the Concelebrated Mass and the magnificent chasuble which dates from the 15th century and which he, Bishop Cassidy, was wearing that evening. The Abbey of Kilnalahan could also boast on the celebrated Leabhar Breac, the great Book of Duniry which was compiled there and is now a special exhibit of the Royal Irish Academy. “It would have been a tragedy – indeed a public scandal – if this ancient ruin were allowed to fall into total decay” Bishop Cassidy declared and then went on to thank the Commissioners of Public Works for ensuring that that had not been allowed to happen. He complimented the architect in charge of the restoration and renovation works, Mr Paul McMahon; the clerk of works, Mr Patrick Herity; to the foreman Michael Lyons and to all the men whose skill was employed in carrying out a splendid job of restoration. Bishop Cassidy thanked his co-concelebrants, including the parish priest Very Rev Michael O’Reilly and welcomed all the priests, sisters and all who had attended the celebrations. He welcomed in particular Rev Fr Gerard Holohan, ODC, Carmelite Fathers, Clarendon Street, Dublin, a native of Abbey who is now aged 89 years; Very Rev P K Egan, PP, Portumna; Rev Fr John Conlan, Franciscan Fathers, Athlone who had brought the 1718 chalice there for the occasion; Rev Fr Michael Doyle, CC, Ballinakill; Rev Fr Frank Murray, Moyglass; Rev Fr Daniel Burke, London, a native of Ballinakill; Rev Fr Martin Coen CC, Craughwell, the well-known historian and Rev Fr Sean Lyons CC, Abbey. Rev Fr Lyons listed all the local bodies and organisations who had co-operated in organising the celebrations including Muintir na Tire, the GAA, the Pioneer Total Abstinence Association and the Badminton Club. Mr P J Pierce, chairman of the organising committee, thanked all who had worked so willingly on the project. Afterwards His Lordship the Bishop, the clergy and a large number of guests were entertained to a meal in the local community centre. Copies of Mr Burke’s newly launched booklet were on view and came in for unstinted praise from one and all. Demand for the booklet was so keen that the limited edition published and printed by Loughrea Printers, appears certain to be quickly sold out”. This page was added on 05/04/2015.